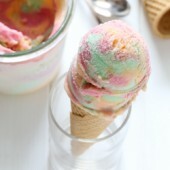 Easy homemade rainbow sherbet, bursting with raspberry, orange and lime flavors! A perfect summertime treat! In a small saucepan over medium heat, combine milk, cream, sugar and salt. Stir to dissolve sugar. Remove from heat. Cover and chill thoroughly, 4 hours or overnight. Puree raspberries until smooth. Optionally add 1-2 tablespoons of granulated sugar to sweeten the puree. Pour through a fine mesh strainer to remove seeds. Cover and chill until ready to use. Churn milk base according to manufacturer's directions. Freeze for 1 hour in a freezer safe container. Divide semi-frozen ice cream base into thirds. Fold in puree and juice to create 3 colors and flavors. Optionally, add 1 drop gel food color to the orange and lime portions for a brighter color. Transfer mixtures to large piping bags. Freeze for 30-45 minutes or until soft serve consistency is reached. Snip off the ends of each bag, swirling the three flavors into one freezer safe container.